NASA’s Low-Density Supersonic Decelerator (LDSD) project finally begun its mission to test a rocket-powered, saucer-shaped landing technology test vehicle into near-space from the US Navy’s Pacific Missile Range Facility (PMRF) on Kauai, Hawaii on Saturday. The high-altitude balloon – carrying the LDSD experiment – enjoyed a successful ascent, along with the powered phase. 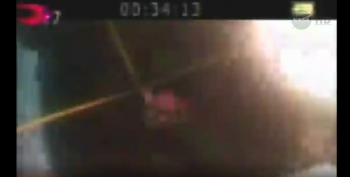 A final additional bonus element of the mission failed via a bad chute deployment. This was the first of three LDSD flights that will determine the flying qualities of the test vehicle. The flight plan also included deployment of two new technologies – an inflatable device and mammoth parachute. However, those landing technologies are not officially scheduled to be tested until next summer, in two additional LDSD flights. This first flight had suffered from weather related delays, prior to Saturday’s missions. 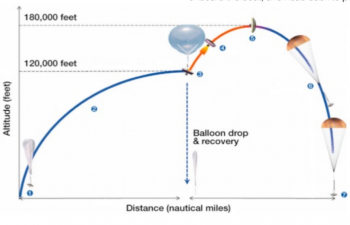 After liftoff from LDSD launch tower – which helped link the vehicle to a balloon; once the balloon floated up – the vehicle was released and the balloon began to lift it to its high altitude destination. The vehicle’s rocket took it to even higher altitudes, to the top of the stratosphere, where the supersonic test began. The balloon was launched without issue, carrying the LDSD test vehicle slowly upward, taking several hours to reach an altitude of 120,000 feet (36,600 meters). At that point, the balloon was released from the vehicle and its rocket kicked in, boosting the craft to an altitude of 180,000 feet (54,900 meters). When the test vehicle reached 180,000 feet and was traveling at about Mach 3.8, the first of the new technologies was deployed, a doughnut-shaped tube called the Supersonic Inflatable Aerodynamic Decelerator (SIAD). The SIAD decelerates the test vehicle to approximately Mach 2.5. This objective was completely successful. The test vehicle then deployed a mammoth parachute (the Supersonic Disk Sail Parachute), which was to carry it safely to a controlled water impact about 40 minutes after being dropped from the balloon. However, the balloon didn’t deploy correctly, appearing to be tangled. Bad chute was then called on the loop. The parachute element was an additional test element and not part of the primary mission. The Low Density Supersonic Decelerator (LDSD) will still have gathered required data about landing heavy payloads on Mars and other planetary surfaces. As such, the mission was successful. The main objective of the LDSD project is to see if the cutting-edge, rocket-powered test vehicle operates as it was designed – in near-space at high Mach numbers. “The success of this experimental test flight will be measured by the success of the test vehicle to launch and fly its flight profile as advertised. 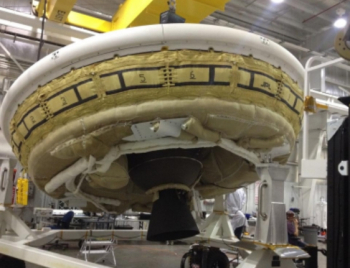 If our flying saucer hits its speed and altitude targets, it will be a great day,” Mark Adler, project manager for the Low Density Supersonic Decelerator at NASA’s Jet Propulsion Laboratory (JPL). The way NASA’s saucer climbs to test altitude is almost as distinctive as the test vehicle itself. A fraction of a second after dropping from the balloon, and a few feet below it, four small rocket motors fired to spin up and gyroscopically stabilize the saucer. This went to plan. A half second later, a Star 48B long-nozzle, solid-fueled rocket engine kicked in with 17,500 pounds of thrust, sending the test vehicle to the edge of the stratosphere. “Our goal is to get to an altitude and velocity which simulates the kind of environment one of our vehicles would encounter when it would fly in the Martian atmosphere,” noted Ian Clark, principal investigator of the LDSD project at JPL. The involvement of JPL becomes even more obvious when the LDSD is noted for its gathering of data about landing heavy payloads on Mars and other planetary surfaces. As NASA plans increasingly ambitious robotic missions to Mars, laying the groundwork for even more complex human science expeditions to come, accommodating extended stays for explorers on the Martian surface will require larger and heavier spacecraft. 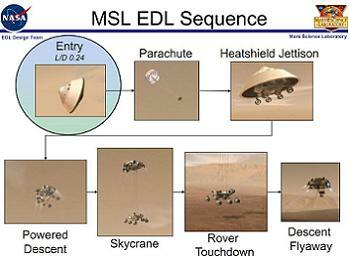 The amazing Entry, Descent and Landing (EDL) approach of Mars Curiosity involved many new technologies, including the SkyCrane decent, but that was for a one ton rover. The huge Mars habitats will require more ambitious landing techniques. These larger modules require “bigger brakes” to slow them down ahead of landing. LDSD will help evaluate these new options.